One of ‘The Nelson and Trafalgar Collection’. Marine Art by Gordon Frickers 76 x 121 cms (30″ x 48″), oils, painted for Victory 2005 available. price upon application. Pickle is shown here beating to windward, her crew reducing sail, a dangerous task without a safety net. This fine painting is a present (28. Sept 2017) with an art agent in London having spent much of the past 20 years in a bank vault in London, one of a ‘Trafalgar Collection’ “HMS Pickle, First With News” is for sale. The owners wish to sell the entire collection. All those are paintings were made during the period I, Gordon Frickers was official artist to HMS Victory and working with Victory 2005. At that time I wrote “I often include a mini portrait of the owner, crew or friends in a painting, occasionally a self portrait too. In the same mischievous spirit I might include a cat, dog, fish or other detail. Few people notice, still some of us like to know they are there. An example is you can see Robin Knox-Johnston on the fore deck, Peter Goodwin Keeper & Curator of HMS Victory and I am there too as is the commander Lieutenant John Richard Lapenotiere. 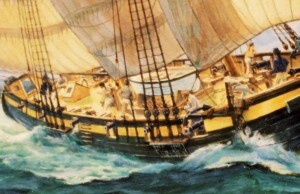 Lieutenant Lapenotiere can be seen standing aft near the helm. This was my second less well known painting of HMS Pickle; the now celebrated “I have urgent dispatches” (available as a signed numbered print from £147.00) having ‘stolen the lime light‘ “. Our HMS Pickle , second and most famous Royal Navy vessel of 5 to carry that name was one of the eyes of the fleet & often referred to by Nelson. 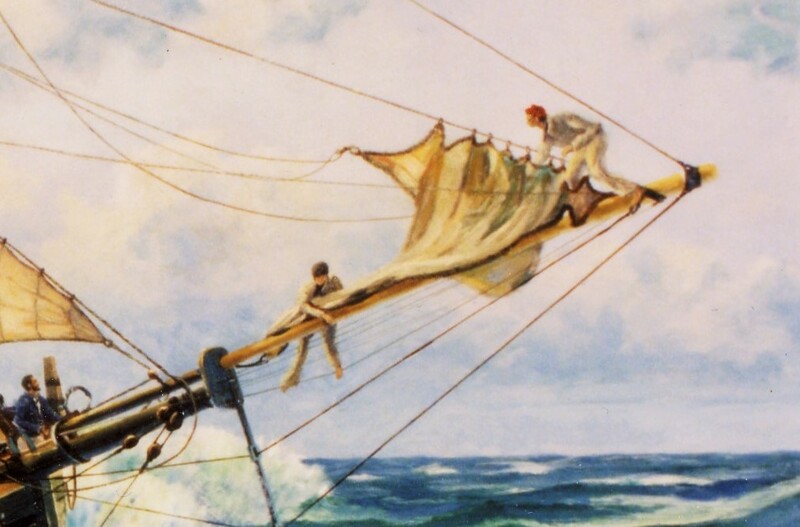 Your artist has sailed on a schooner many times so has a ‘hands on’ understanding. I also researched schooners and cutters of the period, not only British, extensively before starting to create my impressions of HMS Pickle. That said, as always i am interested in more qualities that ‘realism’ or ‘perfectionism’. My aim is to show something of the human feeling, the ambiance and atmosphere; what i don’t want is the sort of highly detailed painting one still often sees and which at art college were referred to as old fashioned chocolate box illustrations. I chose to include HMS Pickle in this series for several reasons; she distinguished herself many times in particular by carrying Admiral Collingwood’s famous Trafalgar Dispatch and she was the sort of size a modern yachtsman can relate to. In this painting you can see several of my friends included crew as portraits, one is my friends, the veteran seaman, Robin Knox-Johnston, another figure is a self portrait. Maybe YOU will be in the next ‘crew’ painted??? They are being watched by LAPENOTIERE the Commander who is standing near the helm, and the boson standing in the eyes of the ship. 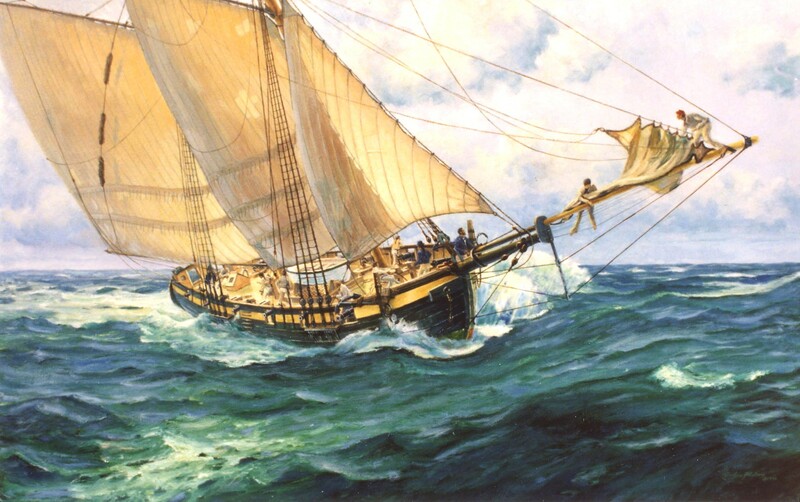 “A very humane vessel“, during the battle of Trafalgar HMS Pickle’s crew of 32 saved the lives of 160 French people. 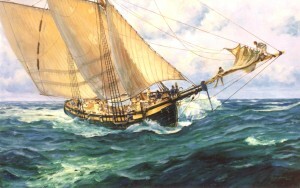 When the replica HMS Pickle arrived at L’Orient, Brittany, France, her people, a bit anxious about calling in a French port with a ‘Nelson’ vessel, were amazed to be greeted by many of the 40,000 descendants of the people her illustrious predecessor, shown in my painting here, had saved during the battle of Trafalgar by rescuing crew from the burning French line of battle ship Achielle. I have also painted another 3 pictures of HMS Pickle. For more see Useful facts + excellent stories about HMS Pickle, first with the news. Talking with us is free and fun, contact us.